All is quiet, except for the sound of doves and guinea fowl in the distance. The sky is bright blue on a winter's morning. I am sitting in an underground research bunker in +Etosha National Park in Namibia. He approaches from the southeast, ambling like they usually do. His footfalls are quiet, eerily quiet, like they usually are for these giants. I see the secretion from his temples and down the inside of his hind legs - he is in musth, an aggravated hormonal state which makes elephant bulls particularly agitated. The bunker provides protection but you still feel small and powerless when an African Elephant bull gets this close. As he approaches the waterhole he inevitably passes by our bunker. He sees us, smells us, whatever but he notices us. An indignant shake of the head, and the dust puffs off him. A deliberate trip of my shutter. 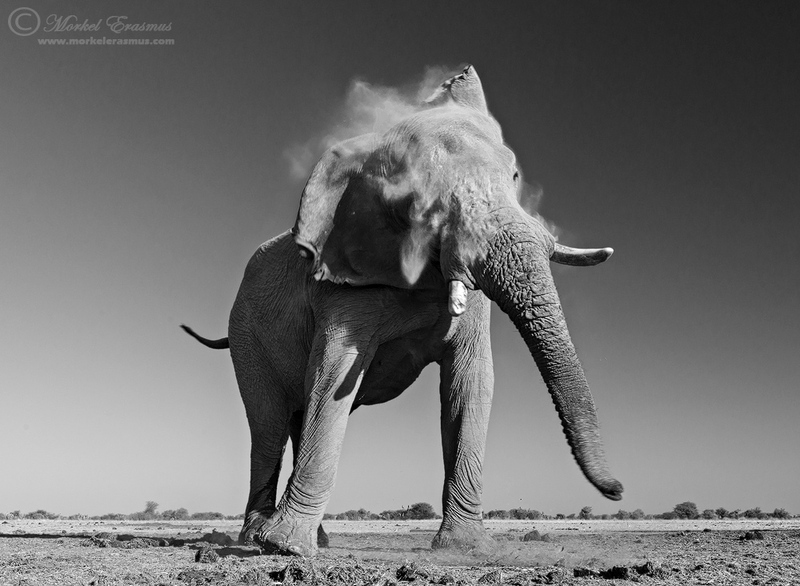 This photo is Copyrighted © Morkel Erasmus.